Shortly after I posted the question asking people if they line dried their laundry year round, I got an email from the owner of a business that manufacturers indoor drying racks, who also reads my blog. Interestingly enough, this guy lives quite close to me and wanted to drop one off for me to check out. He uses all sustainable materials and the racks are hand crafted by laid off carpenters. This contrasts from most drying racks in the market in that they are made oversees and shipped over here. 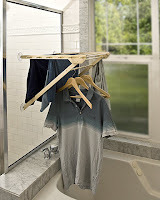 The WindowDry Indoor Drying Rack was developed by the owner out of necessity because the large, bulky rack he was using was continually being knocked down by his 90 pound golden retriever and 4-year-old daughter. He decided to build a rack that could be mounted up and out of the way yet be near or on a window. It was important for the rack to be easily mounted and removed. His motivation for having the rack on or near a window was twofold: ventilation from outside and solar assistance. One of the first questions people ask after seeing this rack is how much weight does it support using suction cups? According to the website, it supports over 25 pounds (average load of wet laundry weighs 11 lbs), but the owner has tested it with his 36 pound daughter and she lived to tell about it! I've been using this rack, mounted in our basement bathroom next to the laundry room to handle overflow from our other two racks. It attaches well to the tile and does, indeed, handle quite a few clothes. I can't say that it would hold one load of laundry, but it's great for all the socks, underwear and other, lighter items that I don't want on display in my backyard for the neighbors to see and, more importantly, blowing off in the wind on our other racks. Even though it's in an area without great airflow, everything dries quickly and it's totally out of the way. There's only one improvement I'd like besides a little larger capacity is that the bottom suction cups don't line up under the top ones. Since I've got it mounted in a tile shower, the top suction cups are attached but the lower two fall on the tile grout and I can't get a great seal. I can't get it to mount anywhere on the tile where all four suctions cups are on tile. Other than that, I love the little bugger and I'm excited about the opportunity to give one away to help jump start the Hang 'Em Dry Challenge this October, where you can pledge to air dry all your laundry for one month. One thing that I've learned about successful air drying of laundry is to make sure you have enough hanging space and this little rack holds quite a bit more than it looks. If you are interested in entering the randomly drawn giveaway (U.S. residents only), please add you name to the comments of this post and check out the challenge. You have until midnight PST Wednesday, September 22nd to enter. Good luck! Anyway. I have one indoor rack that I used (which was awesome in AK in the winter, because it increased the humidity in my house...which was very much needed. Increasing the humidity in my house now is much less cool...but still.) Anyway. It works indoors, so I could use another rack! I want I want I want. Oops where are my manors. Please can I have it? I would be thrilled to win this! I'm looking for new places to put my clothes and this would come in handy. I would so love to win this!! We are unable to dry our clothes outside because of my son's severe allergies (the pollen gathers on the clothes, sheets, towels, etc.). Having something like this, taking up little space but drying so much would be a blessing! Ok count me in for this, I could use some more drying space. This is great and exciting! We live in Phoenix where I have a line across our back porch attached to the center support beam. Another out of the way rack will be AWESOMEEEEE! It is a good thing about Phoenix that our clothes dry within minutes in the summer heat hanging on the line. Hooray! I would love this. We have great southern exposure on our front room windows. What a brillant idea! That is a pretty awesome design there. I like that they're handmade, too. I just ordered a drying rack online in anticipation of this challenge and using this challenge as an excuse to finally do so, but with all the laundry that happens around here, another would be more than welcome! What a cool idea, I would love to try this out! That's an awesome giveaway, just that, I cannot have that as I am far from the US of A! I just stumbled upon your blog and I'm finding it cool. Sounds interesting. I can always use more hanging space indoors for the winter. Thanks! How cool! This would be great in my new apartment. This would be a great addition to my laundry room! That sure would come in handy, since I don't have a yard at all! I would love this!! I'm in Ohio and in another couple of weeks the chances of getting the laundry outside diminish greatly!! Put my name in the random hat, please! I would love to win this! I have actually been looking at ones similar to this on Amazon. I'd love this- I've been living without a dryer for 18 months now and the drying racks sometimes take over my house! Please enter me in the drawing. Thanks! I'd love to win this! Count me in for the drawing. Yeah! I have been looking for an indoor drying rack! I was sold on hanging clothes to dry this summer when we were in Germany. I have been looking for a good indoor rack ever since. Count me in please! I would love to be able to use that. I could attach it to the outside of a glass door in the summer and the inside in the winter. Oh, ooh, ooh, pick me, pick me! A quote (song ) from my daughter at the strawberry "u pick em" fields in South Florida. I would proudly hang it high! I just moved into a new apartment in the city, so this would just add to my attempts at reducing my carbon footprint (I bike to class since it's only 2 miles away). Very cool- I like his business and this seems like a good new place to stick a drying rack. I would love to win this -- if I have something to use, I could probably convince my fiance to use it in lieu of the dryer! This looks awesome, I would definitely love one. Yes please, I'd love to win that! I almost bought a 3rd drying rack this weekend - it would be so great to have one that attches to glass - I live in an apartment and have a sliding glass door. Since I recently decided it's time to freecycle my leaning to the left rack, this would be a wonderful replacement! I'd definitely like to be entered. At the end of every load being hung up, I still have a basket full of little things: reusable cotton rounds, little socks, etc. This would be great! That sounds great! I don't have an indoor drying rack (or an outdoor one either for that matter). I tried drying our clothes spread out on the front lawn a bit last summer but it felt weird for the whole neighborhood to see - even without our socks and underwear out there. I'd love to do line drying I just can't find a good place for it. Please, oh please enter me into the drawing! This would be such a great help. Please sign me up for the drawing. We just bought our first home, and this would be fabulous in our much anticipated laundry room. We've been paying for a wash then hanging clothes on all the door jams in my apartment for too long now. I would like to win it! I agree about not wanting to hang my undergarments outdoors "for the world to see". This would be perfect. Awesome giveaway! I live in an apartment complex and we're not allowed to dry our clothes on the balcony (psshhh), so this is the perfect alternative. Thanks! I've been on the look out for something like this! I have a drying rack that I use, but I need something that can be by a window, but out of the way. I live in a small space and my current drying rack is a pain to get around. Putting it outside is a problem due to the high pollen count (though some days, I am able to place it outside). This drying rack sounds glorious! That's a really nifty design and I'd love to give it a try! I have a large capacity indoor rack that I use but with four kids I'd welcome another. Especially one like this! Count me in! I would love to start hang-drying more. Great giveaway - thank you! Ooh, pick me! I love air-drying my clothes but my line in the basement isn't quite long enough to hold everything. Sent my kids to college with drying racks. Use them at home all the time. That looks great! I'd love to enter the drawing! Then I could have some clothes dry in the upstairs bathroom! I would use a rack like that. I use an inside rack right now and have been hanging things on chairs when I run out of room. yes, i line dry- thanks to my hubby who loves it.i would love to win, please count me in. I'd love to try this. We can't hang our clothes outside because of allergies, so this sounds perfect. I would very much like to have this. Air drying would be so much better for my clothes I think and so much cheaper. I'm expecting my first child in January, and plan on cloth diapering. This rack would be AWESOME for drying diapers!! Sign me up please! That is exactly what I need! I accidently knocked over my drying rack (AGAIN) today and I feel like it is going to collapse if I even look in it's direction. As another Seattleite I have been reading your posts about the hang em dry challenge and nodding a lot. We also use a drying rack as opposed to line drying because you never know what the weather is going to do. And a window mounted drying rack would be perfect for the little items in our wash (undies, socks, baby clothes). Thank you! I'd love this! I currently drape stuff over any convenient surface in my condo- chairs, open cabinet doors, tables. Plus, besides my pollen allergies, drying clothing outdoors in the middle of a city is not a great option! I would like this. It should mount in my tub with no problem. This is very cool. Please pick me! I could use another rack for the wet winter. I recently moved to Portland from sunny AZ, so I desperately miss the ability to effectively dry my laundry outside (in about 10 minutes!)!! Would love to win this laundry rack, as I haven't yet gotten a good indoor drying system going. OOOhOOOOHOOOOH~~~ fingers and toes crossed!!! I live in a condo and we're not allowed to put a rack outside on the patio!!! I use a clothes drying rack for drying year round. It is a great way to save money and reduce my energy consumption. Thank you for advocating air drying and your challenge looks great! Oh! Would LOVE this! I have a crappy one right now that I still use everyday but tend to talk to it rather harshly when doing so. I haul it outside in the summer time but Ottawa in winter means things freeze pretty solidly for a considerable length of time. Would love this! Definitely don't have enough space when the weather is bad to dry indoors. very very interested! We are hanging laundry off of things besides a laundry rack right now. Oh please, oh please, oh please, oh please! Pick me! Yay for locally made laundry-drying racks! Oh man! I would LOVE to have one of these! I live in South Georgia in the middle of the swamp so the humidity makes it almost impossible to hang dry year 'round. I could really use this. I am always looking for a way to dry some clothes. We are having a ragweed filled fall..., I discovered that what I put on my outside line comes in covered with microscopic pollen bits...causing asthma incidents in my son and husband, and me to sneeze uncontollably...so we can't dry outside for 2 months. Extra drying space would be greatly appreciated, and I love the idea of putting American craftsmen to work in this shaky economy. Cool rack! I'd love to win it. Count me in please! I've got out door lines for the summer but since MN has 9 months of winter this would be great! We used to hang all our little things on my daughters' doll clothes rack, but it finally broke after five fine years of service. I'd love to give this rack a try! That looks nifty! I'd love to try it. Count me in for the drawing as well! Love hang drying my clothes when I can - they retain their fit much better over time. Oh, I really really need this! Pick me! That would work really well in our master bathroom with the suction cups on the outside of our shower stall and the clothes hanging over the tub (which is right below the bathroom window). This looks amazing. It would be wonderful to win! I line dry as much as possible, but with only one line outdoors, it makes it difficult to get the laundry done all at once. I love this. I definitely need more drying space! This summer I was using our fence to dry things...but our puppy has decided that its fun to take things off and spread them around the yard...kind of counterproductive! So now I hang things up over the washer and dryer. It works but I would love to have more hanging space. Throw my name in the ring too please! I line dry my clothes outside except for the socks and other personals I don't want the neighbors to see. This would be great! Oh, I surely do need that. Our dryer has been broken since January. I ended up having to take stuff to the laundromat to dry things last winter - thru' the record snow we had here in DC. It was ugly, and required a car. That looks awesome! Count me in! What a GREAT idea! Much better than having one knocked over by kids! Oh oh... Pick me... Pick me!!! I can't believe how excited I was to see you were giving this away. I have been trying to talk my husband into line drying, but we have very limited outdoor space and lots of birds (evidently my husband is very worried about the idea of birds pooping on the laundry!). Winning this would be the perfect opportunity to push our lives a little further into the green zone without fear of the birds!! Oh, this would be great to assist in cloth diaper drying! Count me in! I'd use this all the time! 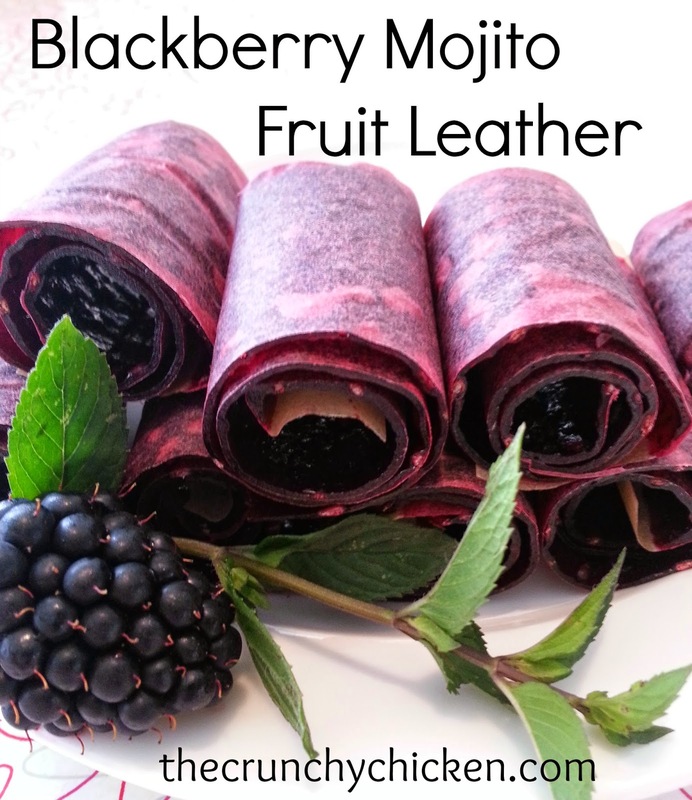 Elisabeth S.
Cool Blog and cool contest and even cooler challenge! me too please!! feel free to randomly draw laura phillips!! :o) id LOVE this!! This would work great in my unused shower! This would be great for the winter! I would SO love to have this.